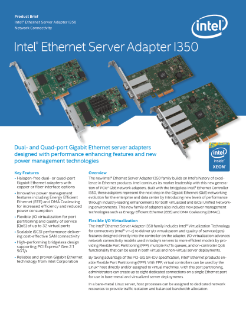 The new Intel® Ethernet Server Adapter I350 family builds on Intel’s history of excellence in Ethernet products. Intel continues its market leadership with this new generation of PCIe* gigabit Ethernet (GbE) network adapters. Built with the bridgeless Intel® Ethernet Server Adapter I350, these adapters represent the next step in the GbE networking evolution for the enterprise and ...data center by introducing new levels of performance through industry-leading enhancements for both virtualized and iSCSI unified networking environments. This new family of adapters also includes new power management technologies, such as energy-efficient Ethernet and direct memory access coalescing.